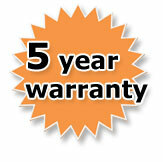 all of our Silent Gliss products come with a free 5 year manufacturers warranty from Silent Gliss themselves. Should a problem occur, one quick phone call to us is all it takes to arrange the collection and repair of your Autoglide curtain track for you. It's that simple.